So I realize I’m a little late to the party on this one. But I have good reason. 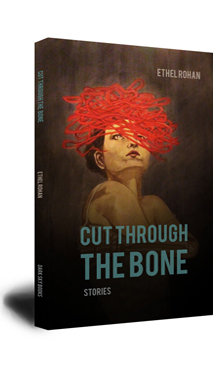 Ethel is not only a fabulous and generous person but also a great talent, and I wanted to make sure I did her wonderful debut, Cut Through the Bone (published by Dark Sky Press) justice. I’ve read this collection of short and very short stories three times since it came out, and each time it has overwhelmed and surprised me just the same. The stories here vary greatly, but all are centered around themes of family, relationships, love, and loss. I feel that many of the reviews I’ve read of Ethel’s book have focused mostly on the loss. With good reason: the characters that walk through these pages are all missing something, whether it is a leg or breasts or a child or love. They have all suffered a great and scarring rending away of some kind. Yet to me, the real wonder, the bright discovery made within these stories was not so much the losses sustained, but what was gained with some uneasy grace, after the initial shock. The characters in these stories, mostly women, are missing much. But they are full to overflowing with other compensations; they are possessors of extraordinary strength, of great determination, of forgiveness, of passion, of joy. And it was this I found especially amazing: Ethel’s ability to write characters who inspire, but never in insipid or easy ways. These protagonists are often full of what others lack, such as the wife/daughter in “Under the Scalpel,” who can carry the burden of horrifying disfigurement, where her mother and husband cannot, or Tracy in “On the Loose,” whose fear and loss of control must be the final kick to start her fighting her assailant. Or the massage therapist in the title story, “Cut Through the Bone,” who must overcome her own fear and shame to comfort a veteran who’s lost a leg. The protagonist in “Gone,” too, must forget her own loss to lend the necessary strength to her new lover to see her as she really is, scars and all. This description may be too pat, may make it seem as though this was one of those books, where the women are strong and the men are weak, where the women are good and the men are all assholes. Not so. Ethel is far more of a complex, nuanced writer than that. True, her men are more often than not in need of help, morally weak, or just the less able of the partnership; but there is not too much bitterness in the extra help the women lend. Instead this seemed to me a deep understanding Ethel has of the weight and balance of love, and the special kind of strength women have always had to possess. Sometimes, too, the women are fragile, are weak, break under their burdens. In “Lifelike,” and in “Make Over,” the women collapse into their own fantasy worlds, unable to cope with life as it is. Ethel has a style that is all her own, perhaps owed in part to her dual American and Irish lives and influences. Her voice has a lovely musicality, with lines dancing out of the stories and begging to be read. Yet she can also tell a story, with tight urgency, expert pacing, and a deft hand at dialogue that rings so true I barely even noticed it was dialogue. She can weave fantastic bits into a story so that you almost don’t notice them–until you’re meant to. Until you suddenly start to believe or disbelieve, and then the happenings pop like firecrackers, just when you though you were safe. This is magic as only someone deeply familiar with the most mundane as well as the most fantastic elements of magic could write it. This is writing that only a truly gifted writer could pull off–and she does, with great gusto, every time. I would highly, highly, highly urge you to pick up a copy of Cut Through the Bone, if you haven’t already. This may be her debut, but Ethel Rohan is clearly going places and you’ll want to say you were there, won’t you? These stories will serve to light the way as you follow her steady climb through the literary atmosphere. This is a really fantastic review. I just read CTtB earlier this month, and had all the same thoughts you did. I remember reading a blurb of it that said the characters in Rohan’s stories are “annoyed” and that felt like such a shallow term to apply to them. Ethel gets at something much richer than annoyance, which just seems like a petty emotion, with the characters in Cut. There’s a deeper motivation to it all. It’s really an incredible read. Thanks, Chris. I totally agree. Glad I wasn’t the only one to see it that way. Great review, Amber. CTTB is a truly beautiful book.